Mycelium Running: How Fungi Can Help Save the World. When research biologist Paul Stamets suggests fungi can help save the world, he is absolutely serious. In fact, he contends they can rescue it in several different ways. There are the medicines to be derived from fungi, probably more than we can yet imagine. Fungi for insect pest control. Fungi can absorb and often digest toxins from their environments — toxins as diverse as heavy metals, PCBs, oil spills, and radioactivity. Fungal partnerships can revolutionize our farming methods. And we can heal the ecosystems of damaged forest lands by introducing selected fungal species into those environments. Paul Stamets is one of the visionaries of our time. He is revolutionizing the ways we look at fungi. This book starts by teaching the basics of mycology. Mycelium are fungal threads that form a network, usually underground. Mushrooms are just their fruiting bodies. Mycelium are so tiny that one cubic inch of soil can contain enough to stretch for 8 miles. But mycelial networks can cover as much as thousands of acres, making certain varieties of fungi the largest organisms in the world, as well as some of the oldest. Fungi build soil by breaking down organic matter, and even cracking apart rocks. Besides that, fungal mycelium enter into symbiotic relationships with trees and other green plants, helping them get water and nutrients from the wider environment by surrounding and even penetrating the roots. Paul Stamets believes mycelium are information-sharing membranes in their environments. He says they are aware, react to change, have the long term health of their host environment in mind, and devise diverse enzymatic and chemical responses to challenges. He cites research to back up these claims. In other words, he is telling us fungi are intelligent, sentient organisms. Because they regulate the flow of nutrients through the food chain, we can use them to bioengineer ecosystems. It has been estimated that three fourths of our medicines come from nature originally. Fungi, Paul Stamets claims, show incredible promise as sources of future pharmaceuticals. Many kinds of fungal mycelium compete with bacteria and viruses in the soil, and in doing that, they secrete a variety of chemical substances that kill those microorganisms. So fungi could protect us from microbial infections in three ways: as antibiotics, by increasing our immunity to fight diseases, and by constructing mycelial mats to filter disease contaminated water. He says, “Preliminary studies on mushrooms have revealed novel antibiotics, anti-cancer chemotherapeutic agents, immunomodulators, and a slew of other active constituents.” Stamets himself has discovered and patented fungal extracts effective in protecting human blood cells against pox viruses. This particular fungi that kills pox viruses lives only in the old growth forests of the Pacific Northwest, as do many other fungal species in that wet climate. He reminds us that these have been logged to the point where only 5% of the old growth are left standing, and who knows what other medicines have been, or still could be lost by this practice. He also discusses the effectiveness some fungal species have shown against the HIV virus, so research is actively continuing on that front. This book contains information on using selected mycelium as “mycopesticides” to control certain insects, such as ants, termites, or beetle blights in forests, with negligible damage to other species or the environment. And these mycelium will continue to grow and offer long term protection. Mycoremediation is the name Paul Stamets gives to the “use of fungi to degrade or remove toxins from the environment” by using mycelial mats. Fungi can be used to clean up mercury, polychlorobiphenols (PCBs), fertilizers, munitions, dyes, estrogen-based pharmaceuticals, neurotoxins — including DDT — dioxins, and stored nerve gas. Fungi can also break down oil spills, although several patents on some species are stopping the use of them for clean-ups, he tells us. Mycoremediation apparently takes quite a bit of skill in choosing the best fungi for a given situation, considering both beneficial and hostile competitive microbes in the environment. Also in some cases, these toxin-absorbing mushrooms need to be harvested and taken to toxic waste sites to be stored, incinerated, or otherwise recycled, he advises. This book advocates no-till farming, because tilling breaks up mycelial mats, which then lets the soil erode. No-till farming also disrupts wildlife less, uses less energy and fertilizer, and releases less carbon dioxide into the atmosphere. He tells us that polysaccharides secreted by mycelium bind soils from erosion. And many temperate fungal species produce glycoproteins to protect mycelium from freezing with the added benefit that they protect green plants during extreme cold. Mycelium decomposing organic matter also raises soil temperatures. So by encouraging mycelium formation, farmers can build soils while creating mycofiltration membranes to trap farm pollutants, such as water run-off contaminated with manure. Mycelium Running has a large section of detailed information on farming and gardening with mycelium. Paul Stamets explains the principles of mycoforestry, which preserves native forests, recovers and recycles debris, enhances replanted trees, and strengthens sustainability of ecosystems. He describes methods of introducing certain species of fungi into recently logged or burned areas to aid in forest recovery, using native fungal species and matching them to the trees they usually partner with. When the mycelium eventually put up mushrooms to reproduce, those are eaten by birds and other animals, who further fertilize the soils and drop seeds from other plant species there, so the new ecosystem develops quickly. The last approximately one third of this book is devoted to detailed information on many individual fungal species, their natural habitats, methods of cultivation, how to harvest and cook them if they aren’t poisonous, their possible medicinal properties, and their potential for mycorestoration of ecosystems. Paul Stamets has a retail company called Fungi Perfecti, which sells equipment for growing fungi, spores, kits to grow them, fungal medicinals and other fungal derived products, books about fungi, gifts, etc. All the products are certified organic by the Washington State Department of Agriculture. He also offers classes in growing mushrooms and other fungi, and occasional classes in mycorestoration at his place near Olympia, Washington. You can get a color paper catalog from Fungi Perfecti, or visit his web site: www.fungi.com. Paul Stamets has received many awards from environmental organizations for his research on fungi and repairing damaged ecosystems. He has written numerous articles and academic papers on medicinal, culinary, and psychoactive mushrooms, and several books on mushroom cultivation. 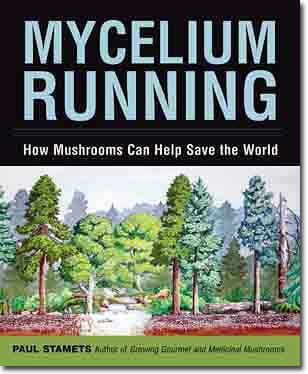 Mycelium Running is a beautiful book with color photos and illustrations on almost every page. This is the book to read if you are interested in using mushrooms medicinally, ridding environments of toxic chemicals, recovering damaged forests, or practicing sustainable agriculture, particularly permaculture. I ‘ve seen Paul Stamets TED talk a while back, which was very interesting. Where can I order this book?